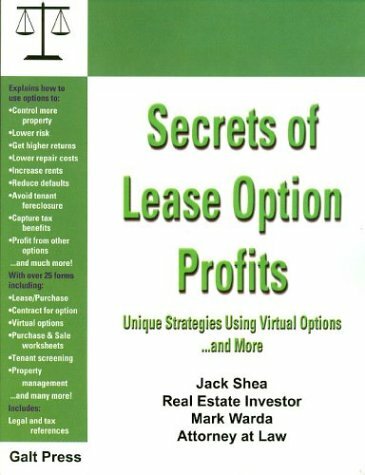 Explains how real estate investors can use lease options to increase their profits and lower their risk, their expenses and their aggravation with rentals. Strategies include both buying and selling on lease options, and using land trusts to make them safer. Written by an investor and an attorney each with a quarter-century of experience, it provides several strategies and 32 ready-to-use forms. Jack Shea has been a real estate broker and investor for over a quarter of a century. Before that he was an Air Force pilot, the head of marketing for NYSE companies and taught graduate school courses. He has a B.S. in Engineering from the University of Illinois and is currently a Qualified 1031 Exchange Intermediary for clients across the U.S.
Mark Warda has been an attorney for over 25 years and is the author or co-author of over 60 books, including Land Trusts for Privacy & Profit and Essential Guide to Real Estate Leases. He obtained his B.A. and J.D. degrees from the University of Illinois and is currently writing self-help law books and running Land Trust Service Corporation in Clearwater, Florida.